Income protection is the most important ‘living’ insurance cover you can have. Why? Because without your income, you cannot continue to pay your mortgage, put food on the table or carry on life financially. Income protection is a monthly benefit that pays you up to 75% of your income and covers you if you are not able to work for a medical reason. It pays you until you are back at work and if necessary until you are 65, depending on your occupation, offering long term protection against this risk. Income protection is tax deductible and therefore cost effective for the benefit it provides. Life insurance is all about the loved ones you leave behind and leaving them in a position where they can financially absorb the impact of losing you. A good contract will cover you against the risk of death, regardless of the cause of death. We will help you structure your life cover so it is paid for from your ‘gross’ income instead of ‘net’, keeping the real cost of this cover to a minimum. Total and permanent disability (TPD) cover provides a level of financial security to you if you are unable to work due to long term illness or injury. You can interpret the name of this cover literally, as you must never be able to work again, as agreed by two doctors in order to claim, in either ‘any occupation’ or your ‘own occupation’. Understanding the distinction between the two definitions could make a significant difference to whether you are ultimately paid out or not and this is one area we can assist. Trauma insurance is a lump sum cover, which will pay out if you suffer a defined Trauma event. There can be significant differences between different insurance contracts, and no more so than Trauma. Approximately 80% of claims paid out for Trauma are for Cancer, Stroke, or Heart Attack and taking out a quality contract that is affordable is key. This is currently the least insured risk in Australia and a very misunderstood insurance. If you are unfortunate enough to suffer a Trauma event, this cover will make a significant difference to how you cope with it financially, both while you are acutely affected by the Trauma event, but equally importantly to give you financial options after the event occurs. We will assist you to identify a quality contract in market to meet your needs and assist you to structure it for maximum chance of payment. Cover in line with your needs — we will identify what you would like to happen if certain medical events were to occur, that could impact your ability to earn an income. We will take into consideration the assets you have currently that could be used to self insure part of your risk and we will help you calculate a suitable amount of cover. Competitively priced policies — we review the market on price and identify cost effective policies. We have access to a market comparison software to assist with this and ensure we're taking a wide reaching search of the market options. Policies that have good contracts — we filter the cost effective contracts against the quality contracts. The best policies for you will depend on your individual circumstances. Certain insurers are better for self employed people, for example, as they have more flexible 'return to work' definitions than others. Others we may favour for women for example, because the breast cancer definition is particularly good. Tax effective structuring — we see poor structuring of insurance regularly, which means a higher NET cost. Our advice is very conscious of structuring your cover to deliver a low net cost. Below we detail the cover available to you personally, followed by cover for business owners and we then detail out a structuring option called Level Premium, which is quite often best over the long term. When you set up your insurance, you will have the choice of Stepped or Level Premium. 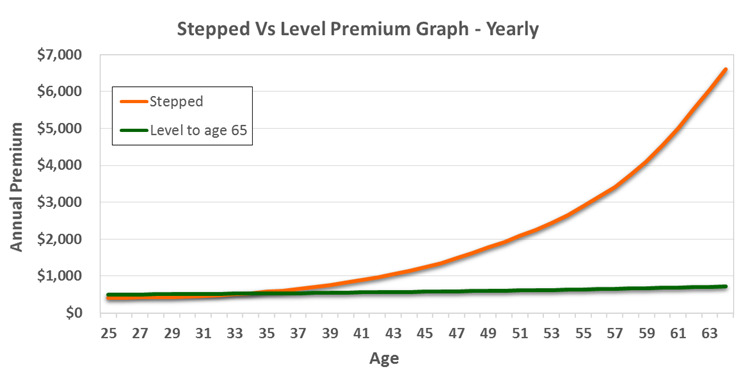 Stepped Premium is initially cheaper than level, however will increase significantly as you age. Level Premium however, will not increase due to you getting older. Depending on your age, the potential savings on level premium can run into six figures and is therefore a very important consideration, as part of insurance structuring. Below is an example of how Level Premium works. The graph shows the price of a level premium Trauma contract at $200,000 of cover for an office worker. It demonstrates that at every interval you would be better off having set up a Level Premium at an earlier age. For the 25 year old with the foresight to put this cover in place immediately, they will maximise their cover time, being protected over 40 years and will save a considerable amount of premium as well.